Education in Norway is mandatory for all children aged 6–16. The school year in Norway runs from mid August to late June the following year. The Christmas holiday from mid December to early January historically divides the Norwegian school year into two terms. Presently, the second term begins in the beginning of January. Organized education in Norway dates as far back as medieval times. Shortly after Norway became an archdiocese in 1153, cathedral schools were constructed to educate priests in Trondheim, Oslo, Bergen and Hamar. After the reformation of Norway in 1537, (Norway entered a personal union with Denmark in 1536) the cathedral schools were turned into Latin schools, and it was made mandatory for all market towns to have such a school. In 1736 training in reading was made compulsory for all children, but was not effective until some years later, when ambulatory schools (omgangsskoler) were also established. In 1827, Norway introduced the folkeskole (people's school), a primary school which became mandatory for 7 years in 1889 and 9 years in 1969. In the 1970s and 1980s, the folkeskole was abolished, and the grunnskole (foundation school) was introduced. Traditionally poorer counties like Finnmark and Hedmark have the highest shares of inhabitants who only have completed the compulsory primary education, with numbers as high as 38%. The Norwegian school system can be divided into three parts: Elementary school (Barneskole, ages 6–13), lower secondary school (Ungdomsskole, ages 13–16), and upper secondary school (Videregående skole, ages 16–19). The Barneskole and Ungdomsskole levels are compulsory, and are commonly referred to as Grunnskole (literally translates to "'base-school"). Elementary and lower secondary school are mandatory for all children aged 6–16. Before 1997, mandatory education in Norway started at the age of 7. Students often have to change school when they enter lower secondary school and almost always have to change school when they enter upper secondary school, as many schools only offer one of the levels. In the first year of primary school, students spend most of their time playing educational games and learning social structures, the alphabet, basic addition and subtraction, and basic English skills. In Grades 2-7, they are introduced to mathematics, English, science, religion (focusing not only on Christianity but also on all other religions, their purpose, and their history), aesthetics, and music, complemented by geography, history, and social studies in the fifth grade. No official grades are given at this level. However, the teacher often writes a comment, analysis, and sometimes an unofficial grade on tests. Tests are to be taken home and shown to parents. There is also an introductory test to let the teacher know if the student is above average or is in need of some assistance at school. When the students enter lower secondary school, at age 12 or 13, they begin getting grades for their work. Their grades together with their location in the country will determine whether they get accepted to their upper secondary school of choice or not. From eighth grade, students can choose one elective (valgfag). Typical offered subjects are German, French, and Spanish as well as additional English and Norwegian studies. Before the educational reform of August 2006, students could choose a practical elective instead of the languages. Teens born in 1999 and later could once again choose a practical elective upon starting lower secondary school, thus getting the option to choose two electives. A student may take the Grade 10 exam in a particular subject early as long as he or she has been granted an exemption from further instruction in the elementary/middle school curriculum of that subject. In 2009, Norwegian fifteen-year-olds performed better in OECDs Programme for International Student Assessment than other Scandinavian countries, with significant improvement since 2006. In mathematics, however, the top scoring 10% were estimated to lag three years behind the top scoring students in Shanghai. Secondary education in Norway is primarily based on public schools: In 2007, 93% of upper secondary school students attended public schools. Until 2005, Norwegian law held private secondary schools to be illegal unless they offered a "religious or pedagogic alternative", so the only private schools in existence were religious (Christian), Steiner/Waldorf, Montessori schools, and Danielsen [no]. The first "standard" private upper secondary schools opened in the fall of 2005. Videregående is the equivalent to a high-school. Prior to 1994 there were three branches of upper secondary schooling: "General" (language, history, etc. ), "mercantile" (accounting, etc. ), and "vocational" (electronics, carpentry, etc.) studies. The high school reform of 1994 ("Reform 94") merged these branches into a single system. Among the goals of the reform was that everybody should have a certain amount of "general studies" large enough to make them eligible for higher education later, meaning more theory in vocational studies, and it should be possible to cross over from one education path to another without losing too much credit. In the old system, two years of carpentry would be wasted if you wanted to switch to general studies, but in the new system you could keep credit for at least half of it. Since the introduction of the reform Kunnskapsløftet ("the knowledge promise" or "the lifting of knowledge", the word løfte having two meanings) in the fall of 2006, a student can apply for a general studies (studiespesialisering) or a vocational studies (yrkesfag) path. Inside these main paths there are many sub-paths to follow. An upper secondary school usually offers general and vocational curriculum. Vocational studies usually follow a typical structure named the "2+2 model": After two years of school training (with workshops and short internship in industry), the student goes in apprenticeship for two years in an enterprise or a public institution. The apprenticeship is divided into one year of training and one year of effective work. Some vocational curriculum are nonetheless entirely school-based, and other include 3 years of apprenticeship instead of 2. The new reform makes the incorporation of IT into the schooling mandatory, and many counties (responsible for the public high schools) offer laptops to general studies students for free or for a small fee. Kunnskapsløftet also makes it harder to switch between electives that you take in the second and third year in the general studies path. Students graduating upper secondary school are called Russ in Norwegian. Most of them choose to celebrate with lots of parties and festivities, which, impractically, take place a few weeks before the final examinations of the final year. The titles of educators in Norwegian schools vary with the degrees they have. Pre-school teacher (Førskolelærer or barnehagelærer): These teachers are primarily employed in kindergartens and the first four grades of primary school. To become a pre-school teacher in Norway requires a bachelor's degree from a university college. Adjunct teacher (Adjunkt): These teachers primarily work between the 5th and 10th grades of lower secondary school, but some are also employed in high schools, usually in minor subjects. To become an adjunct requires a bachelor's degree in a particular subject from a university or university college. Many adjuncts have studied other courses at a lower level, which they teach as a secondary subject (a mathemathics teacher may have studied physics at a lower level, but teaches both). In addition, a one-year course in pedagogy is required. Lecturer (Lektor): Lecturers work in upper secondary school and high schools, from 8th grade up to the third year of high school. Lecturers have a master's degree from a university, along with a pedagogy course. Lecturers usually have a more academic approach to teaching than other teachers. Where there are more applicants than students admitted, applicants are ranked based on their grades from upper secondary school. To gain access to studies commonly requiring a high GPA, like medicine, law and engineering, many students re-sit their upper secondary school examinations to improve their grades. Universities, which concentrate on theoretical subjects (arts, humanities, natural science), Supply bachelor (3 yrs), master (5 yrs) and PhD (8 yrs) titles. Universities also run a number of professional studies, including law, medicine, dentistry, pharmacy and psychology, but these are generally separate departments that have little to do with the rest of the university institution. University colleges (høyskole), which supply a wide range of educational choices, including university degrees at bachelor, master and PhD levels, engineering degrees and professional vocations like teacher and nurse. The grade system is the same as it is for universities. Private schools, which tend to specialize in popular subjects with limited capacity in public schools, such as business management, marketing or fine arts. Private schools do not loom large on the horizon, although the fraction of students attending private schools is 10% in higher education, compared to 4% in secondary and 1.5% in primary education. There are no formal distinction between vocational and non-vocational higher education. Before the 19th century the main source for higher education of Norwegians were the University of Copenhagen. 1750: The Norwegian Military Academy is established as the "Free Mathematical School" with officer training and technical disciplines such as geographic surveying, drawing, fortification and mathematics. 1757: The "Mining Seminar" is established at Kongsberg to train engineers for the Kongsberg Mines. This education was moved to the Royal Frederik's University in Christiania (Oslo) in 1814 (three years after the establishment of this university). 1811: The University of Oslo is established as Universitas Regia Fredericiana modeled on the University of Berlin (the "Humboldt Model"). 1910: The Norwegian Institute of Technology is established in Trondheim. 1936: The Norwegian School of Economics and Business Administration is established in Bergen. 1943: The BI Norwegian Business School (BI) is established as a merchant school. 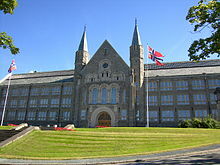 1946: The University of Bergen is established. 1961: The Oslo School of Architecture and Design is established. 1972: The University of Tromsø is established. 2005: Stavanger University College is given status as university, thus becoming the University of Stavanger. 2007: Agder University College (established 1994) is given status as university, thus becoming the University of Agder. 2011: Bodø University College becomes University of Nordland, the eighth university in Norway. Norway has multiple different grading systems, both unique ones and ones that have been based on foreign grading systems. The formerly most common system of grades used at university level was based on a scale running from 1.0 (worst) through 6.0 (best) with 4.0 or below being considered passing grades. ^ Aamodt, Per (1990). "A New Deal for Norwegian Higher Education?". European Journal of Education. 25 (2): 171–185. JSTOR 1503087. ^ Cultice, Wendell (1967). "The School System of Norway". The Clearing House. 42 (2): 119–121. JSTOR 30183285. ^ "Her bor de med høyest utdanning". Archived from the original on 2016-04-15. Retrieved 2016-05-08. ^ Nilssen, Fred Harald. (2014, 25. juni). Grunnskolen. In Store norske leksikon. .
^ "Statistics Norway: Upper secondary school students by type of study and school ownership". Statistisk Sentralbyrå (Norwegian) - select all regions, all 'studieretning', all 'eierforhold', year 2007 revidert. Click 'vis tabell' ('show table'), compute percentages from result. ^ Johnson, Palmer. "The Norwegian System of Public Secondary Education". The School Review. 44.8 (1936): 608–14. JSTOR 10.2307/1080362. ^ a b c "TVET in Norway". UNESCO-UNEVOC. 2013. Retrieved 29 July 2014. ^ Nordland, Eva (1969). "Teacher Training for Norwegian Schools". International Review of Education. 15 (1): 65–74. JSTOR 10.2307/3442072. Norwegian Ministry of Education and Research. "Upper secondary education" (in Norwegian). Norway.org.uk. Archived from the original on 2007-11-11. Retrieved 2007-11-29. Norwegian Ministry of Education and Research. "Primary and lower secondary schooling" (in Norwegian). Norway.org.uk. Archived from the original on 2007-11-11. Retrieved 2007-11-29. (in Japanese) Ishii, Yuri (石井 由理; Yamaguchi University). "Awareness of Global Citizenship in the Norwegian School Curriculum(Educational Philosophy)" (Archive; ノルウェー学校教育課程に見られる地球市民の視点(教育哲学)). International Christian University publications. I-A, Educational studies (国際基督教大学学報. I-A, 教育研究) 43, 29-38, 2001-03. International Christian University. See profile at CiNii. See profile at International Christian University Repository (国際基督教大学リポジトリ). English abstract available. Wikimedia Commons has media related to Education in Norway.